At long, long, last, Martlesham Heath has its very own Jacques Brel themed department store. Ground floor includes a modest Sensational Alex Harvey Band section. Confused and lacking Focus? You won't be if you watch this now. 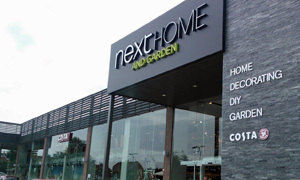 Seven days ago the ribbon was cut on a shiny and substantial new Next Home & Garden store in up-and-coming Martlesham Heath. Here, in Austerity Britain, the punters are parked on the verges, such is the demand for soft furnishings and Olympics bric-a-brac. With escalators to the left and the right, it's up a floor to "the largest and fastest growing coffee shop chain in the UK". Cheers for Costa, as they say in Southwold. It's 1pm and seemingly we're not the only ones wanting a light lunch. Not quite queueing out the door, but near enough. Our 20 minute wait is made tolerable by the kindly baristas bringing us long-stayers bottles of water and muffin tops. Not really. Eventually we hit the till -- "sorry for the wait" -- and I'll take a warmed all day breakfast bap, please, plus a white Americano. Normally I'd go back for a coffee after some savoury but there ain't the time. Plenty of comfy seating with a pleasing view of the Bennetts car park, ideal for people watching. Bap, served with Heinz ketchup, is no more than OK and not a patch on what's available at Langers Snack Bar about 200m away. Best thing is the unassuming raspberry ripple cupcake, a soupcon of sweetness on the side. It's very good and loaded with butter cream. Yum. No whiff of WiFi or papers, shame, but not bad otherwise if you can cope with the queues. If it was a car -- Enterprise Chevy Lacetti. If they were passing by -- Gavin Friday.